Her head tilts back. Slowly at first and then suddenly fast. It finishes of course with a thud against the wall. Then her mouth opens and hangs that way. If she acts like this the next time she’s around her family, I’m sure they’ll kick her out for good. I stare at her. This girl is the cause of so much stress and so much drama in my life. Still, I just can’t find any need to walk away. She’s been doing this a lot lately though. She talks a big game about being able to handle every drug she’s ever taken, but she obviously has no clue about how much we all know. I’m surprised she hadn’t noticed there weren’t even any candles in my bathroom, so why else would I hear a lighter being flicked? The random coughing couldn’t ever be masked by the sound of the music from her phone, and neither could the smell of something foul by drowning herself in coco de mademoiselle. The worst was the kiss. How could she not wash her mouth out and expect me to not taste the poison on the tip of her tongue? Her excuses are becoming flat and over used; she runs the water because it helps her pee, or the coughing is because she quit smoking, or maybe she forgot to brush her teeth or ate some raw onions. Sometimes, she must just like to listen to music in the bathroom for a half hour every time she goes. I still don’t have the heart to tell her that I know. So I sit next to her, I stare at her with hopeless confusion, and I try to hold the moment for what it is. Her eyes, though closed, are probably shaking around violently in the sockets with the intrusion of the drug. Her back is rigid and her legs are crossed on the ground. 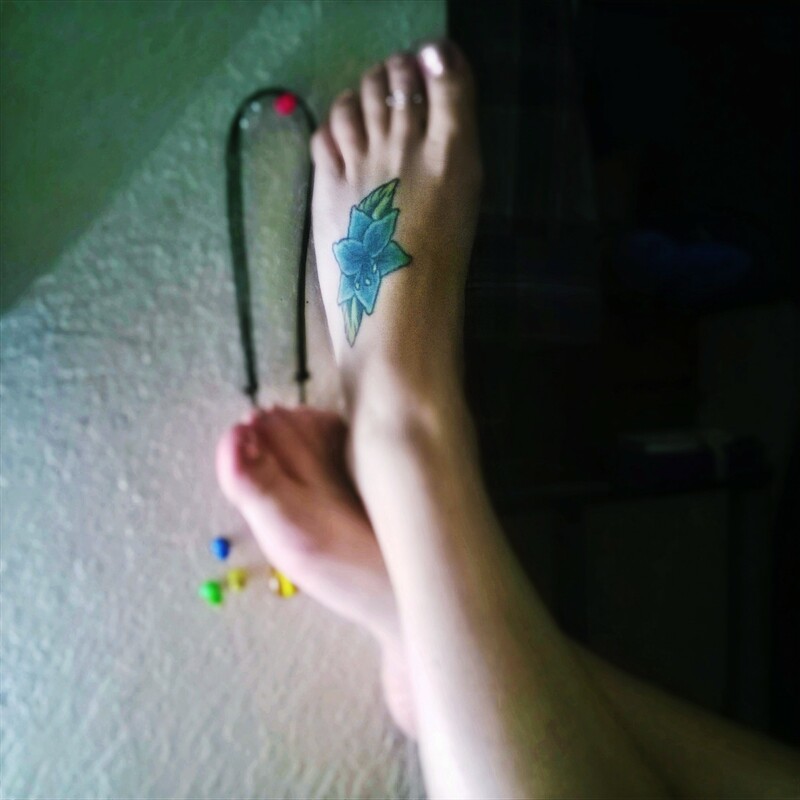 The paint is chipped from her toe nails, and the tattoos on her feet are slowly fading from wearing shoes. The hairs on her leg prickle past my hand as I run it up her calf. She hated to shower, so I’m sure she hated to shave and who am I to judge that? I do too. She never smells bad though, in fact even when she claimed to be at her dirtiest, her skin smelled the sweetest. I love the dimple on her left hip, and I feel compelled to tell her every time my fingers caressed through it. Her stomach had a little bump from turkey and cheese sandwiches, pringles and Slim Jims we always ate from the circle k. Her breasts are kind of pointed, but they fit her body well, and she loves that I love them even though she always claimed to hate them. Her arms are kind of skinny and they lead down to the cutest little hands my monster sized fingers could ever hold. Her neck is a little longer for her shorter stature, and that along with her ears and jawline are the best places to kiss slowly if I intended to turn her on. She has tattoos in all of the right places, not too many, nothing belligerent, and everything with a beautiful shade or outline of blue. The best were the dove above her hip bone, and the lily on her foot. They both let me know that she remembered beauty and peace from time to time. Huh, I just realized the lily is the only one completely colored in, small green leaves surrounding the blue petals. It’s perfect. I stop rubbing her leg so I can hold her hand. I rub the back of it slightly with my other hand. She twitches, and for a few seconds her eyes open. So I stare into her. They are a smoky grey now, devoid of the original intensity of the baby blue color they used to hold. Still, the eyes that once left me drowning have me now gasping for air. She squeezes my hand slightly, says “I love you,” and then leans her head against my shoulder. I wait. I can’t say it back and I never do when she is like this. I don’t love the heroin as much as it seems to love me. So, I wait until she falls asleep, so I can whisper back to the part of her I’m sure is still alive inside. I can’t take my eyes off her body. Her skin glows red under the Christmas lights lining the large closet space attached to my brothers room that I live in. I was embarrassed as hell to even think about someone this beautiful seeing how I live, but she loves it, and that wasn’t the drug. The craziest thing about her is the way she makes me feel. While everyone else just sees a relapsing heroin addict, a girl with a pill problem, and a complete waste of oxygen, I see a chance. A chance at something real, so real that the only action others can take is to shun. When others see her brown teeth, or notice how gray and hue-less her eyes are, they imagine a disgusting life. I often wonder what they really think because I know that they all hide their own demons. To me, she is the most beautiful creature in the world. She might be a disaster, but so am I, and at least we have the decency to admit it, even if it’s just to ourselves. She’s not perfect to society, and I love it. She hates to shave and listens to rock, and I can respect that. She drinks beer, snaps into Slim Jims, and can stand up for herself in arguments. She has hobbies, dreams, and a celebrity crush. She is more real than any other person I’ve ever met, and for some time at least she’s mine. If she ever leaves again, I tell her that I will go and find her. I mean it. She is my muse, and I’ll die to protect that. Her eyes pop open again and she finally picks the pipe up and aims to take another hit. The weed burns making her face glow even brighter for a second. She holds the smoke in as she turns her body to lie her head down on my pillow and hang her feet over my legs, then releases. She locks her eyes with mine, so I flash a smile. When I get the pipe back I put the end up to my mouth and run my thumb along the steel roller of the lighter. The flint sparks and ignites the gas, and the resulting flame burns deep into the bowl. I inhale so deep I almost cough but I hold it in because she closed her eyes again and I don’t want to disturb her. So I tilt my head back against the wall and close my eyes as well. I release my lungs’ hold on the smoke slowly. Brian Hosier joined the U.S. Army in January of 2004. Served one tour in Iraq, as a Combat Line Medic for 2-22 Infantry Battalion. He returned to school in 2011 and is currently studying English at Paradise Valley Community College with an emphasis in technical and creative writing. Brian enjoys camping, hiking, and reading.